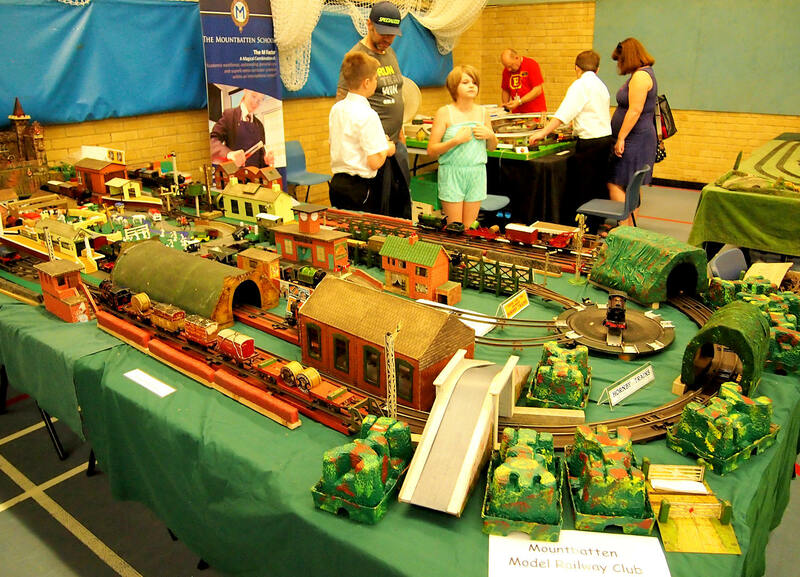 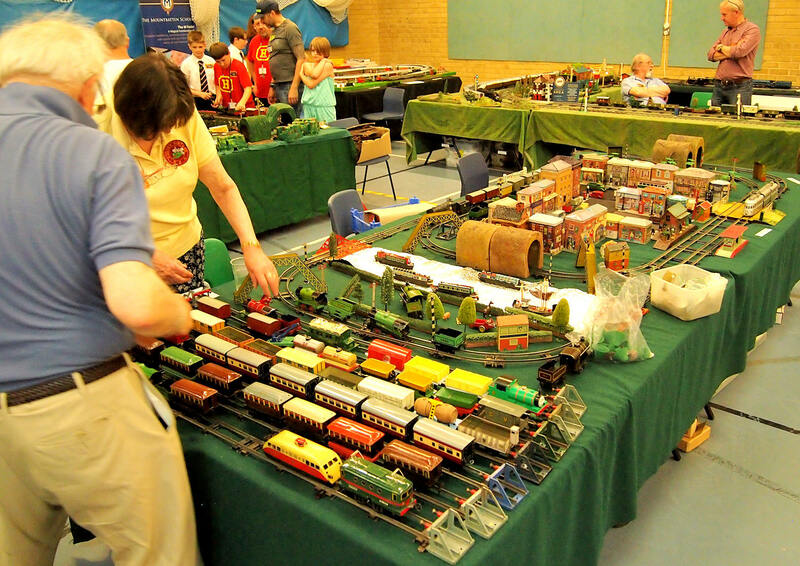 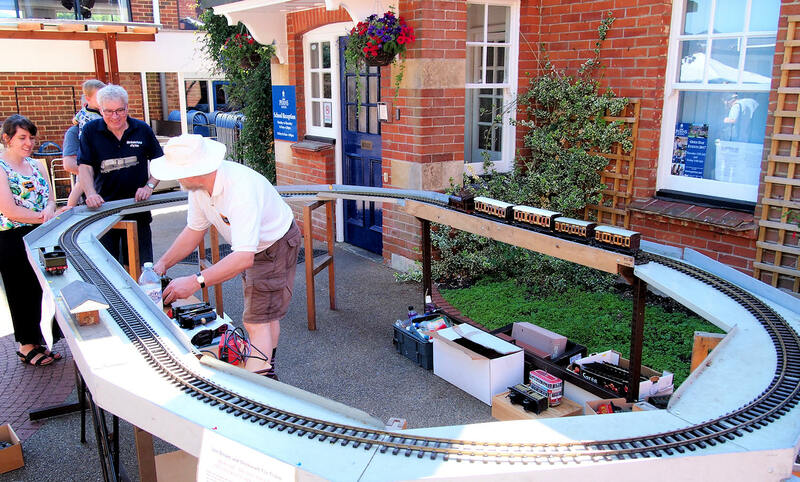 Perfect English weather was the setting for the 25th ‘Silver Jubilee ‘ Alresford Festival of Toy Trains held at Perins School on 17th June 2017. 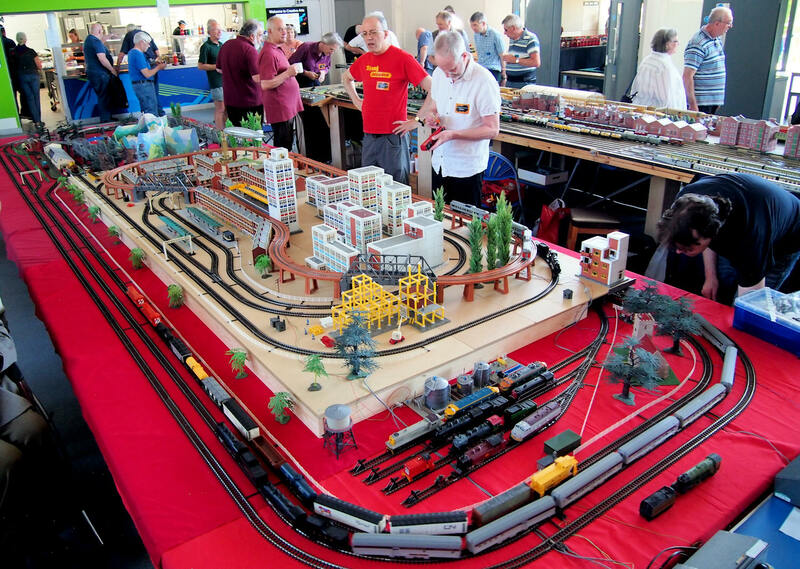 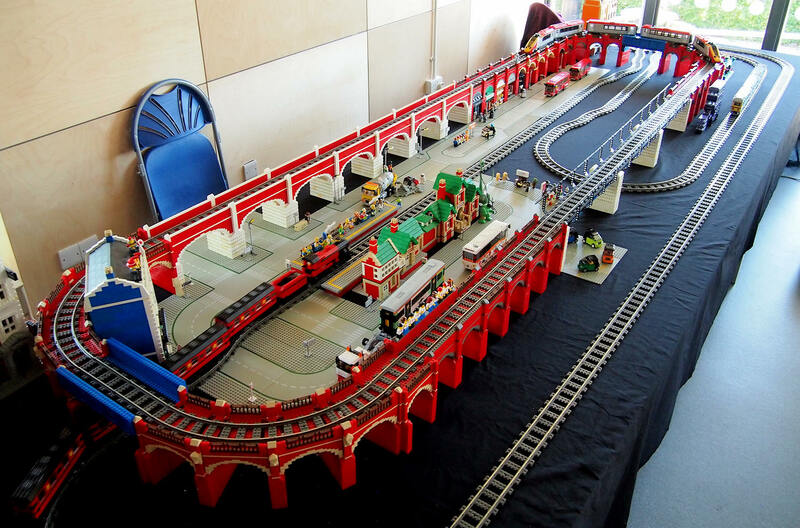 Over 600 visitors enjoyed 23 layouts and nearly 90 sales tables, together with BBQ, Real ale and Ice Cream on the concourse with some sales tables and trains also outside. 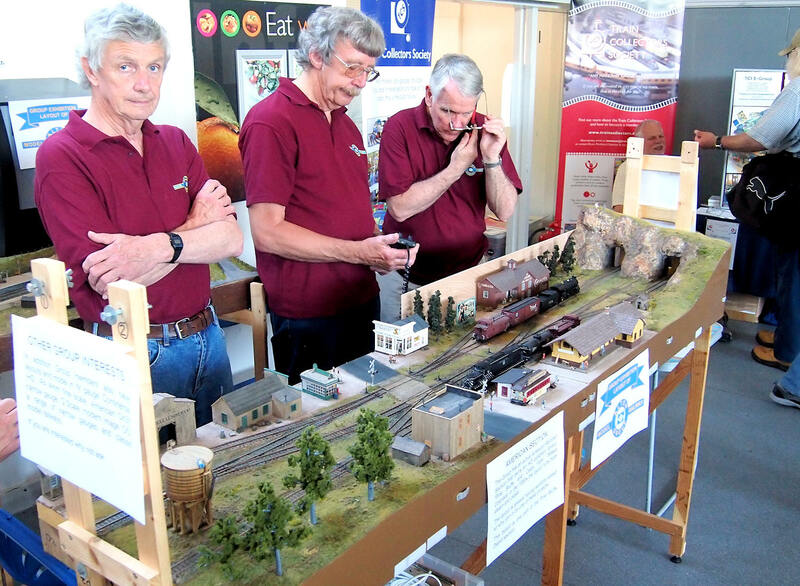 The TCS Society stand was first on view with Rod Hannah, Tony Stanford and Malcolm Pugh actively promoting the society and encouraging new members and renewing subscriptions. 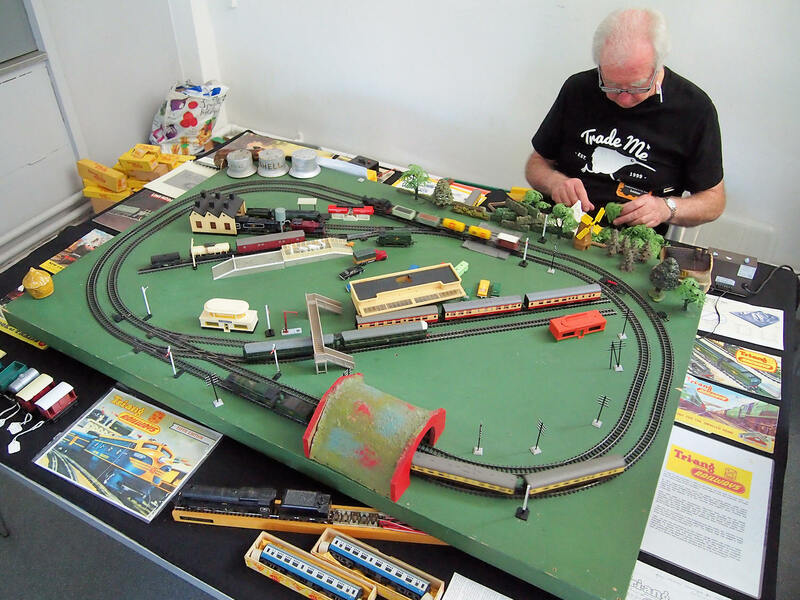 In the corner Marcus Lecky was running Bob Leggett’s Tri-ang TT Shop display layout and taking pride of place was a Merchant Navy pulling a rake of repainted blood and custard coaches with a Railcar also on duty. 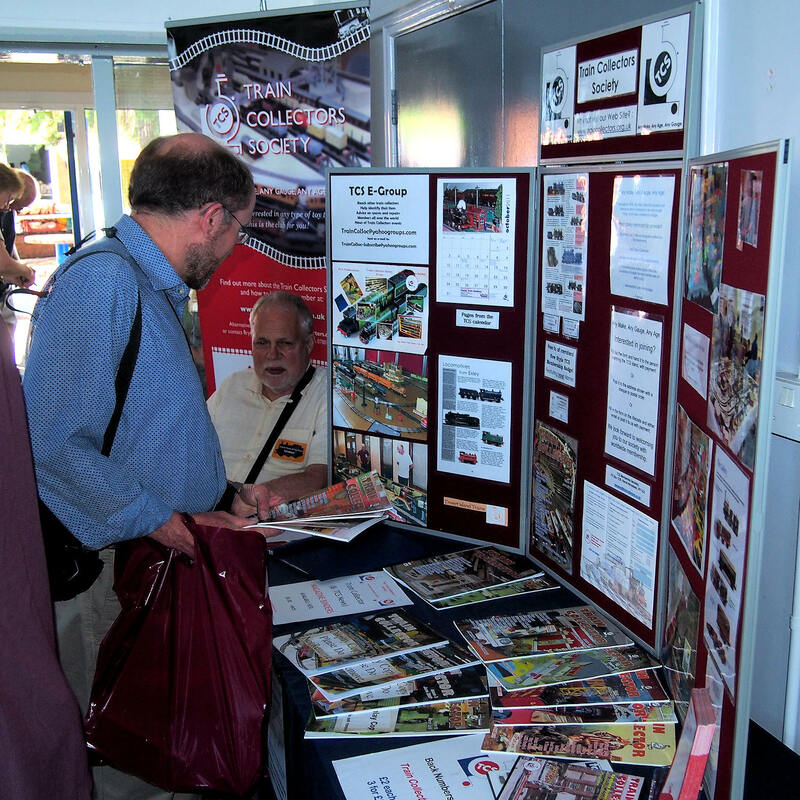 Alongside Rob Hampton was selling TT items and was also publicising his new book on Tri-ang TT which will be launched shortly. 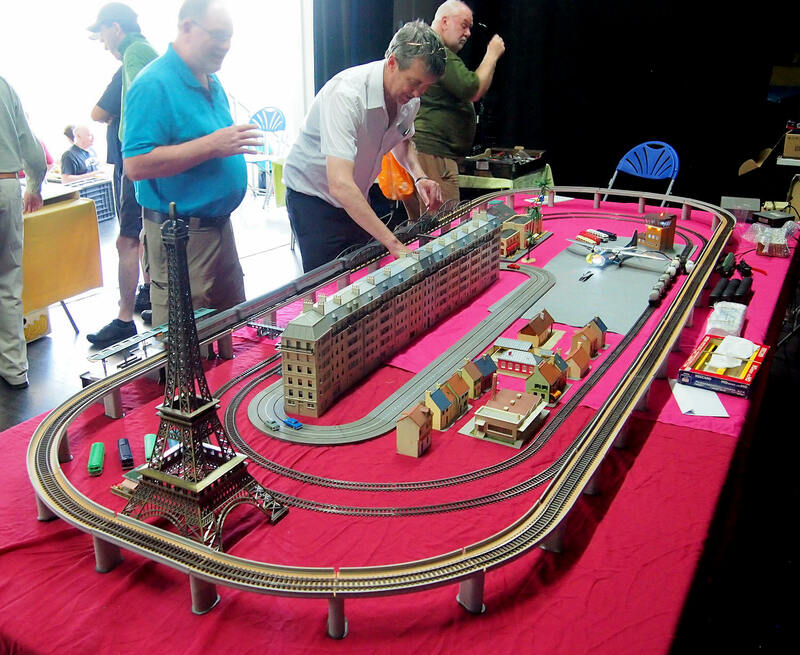 Moving round we have David Lyon’s new slightly smaller Tri-ang 00 Gauge and Minic Motorway layouts, with almost as many features as the previous layout this really shows off how well the motorway can be incorporated with railways. Visitors are always fascinated by the cars stopping at junctions and level crossings. 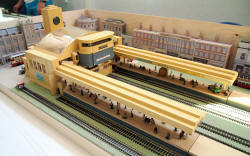 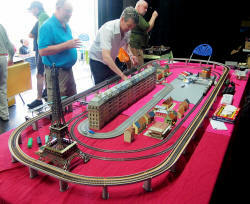 One of the much awaited displays at the show was David and Jan Nevett’s Gamages 00 Gauge London Terminus Station. This was built for Gamages in 1953 possibly by Bertram Otto and David has spent hours cleaning and restoring it and had set it on a board within a London scene using Hornby Emu’s running in and out of the station. 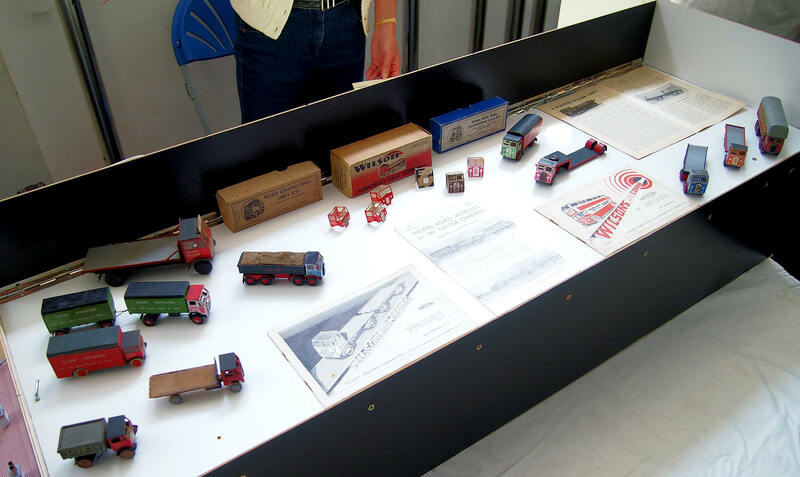 David was overwhelmed with the response and also with the interest in his excellent Wilson Lorry display and met three other Wilson collectors ! 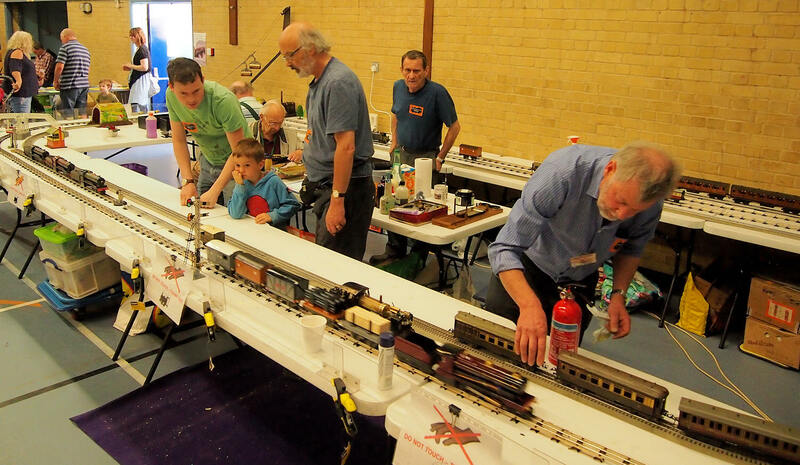 In front of the stage Steve Knight , Marcus Archer and Terry from the Kitmaster Club were running Airfix RTR 00 Gauge Trains including the Dr X set and Wild West Set. 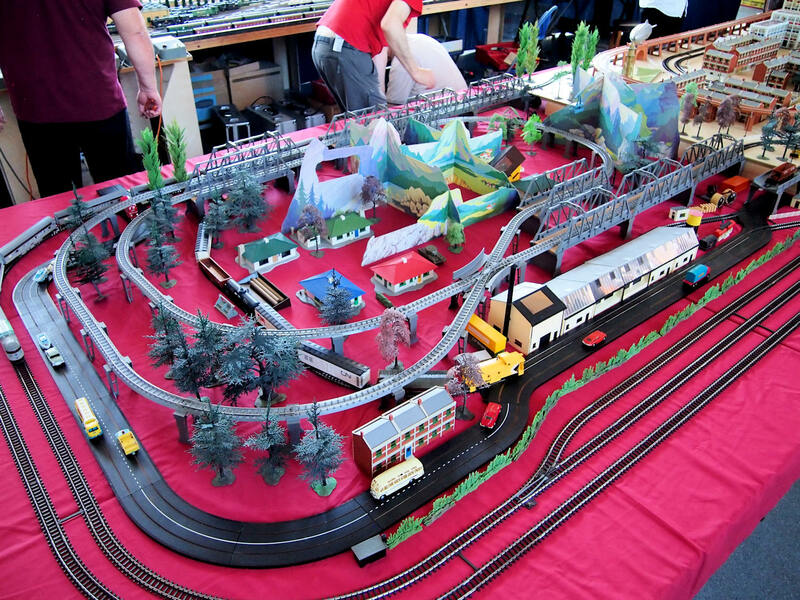 Roger and Barbara Burnish were running Hornby Dublo 3-Rail on their neat scenic layout which as usual had some lovely alternative items such as Thomas and Toby the tram engine. 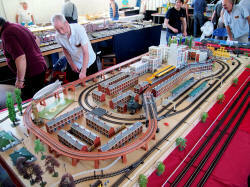 The Station and Goods Yard were full of detail including many Master models. 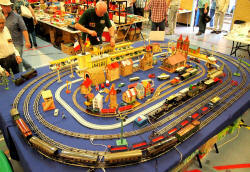 Alongside Any Heyelman set up Italian HO Gauge and had several circuits with trains by Lima, Ingap and Rivarossi and various Italian models by other manufacturers. 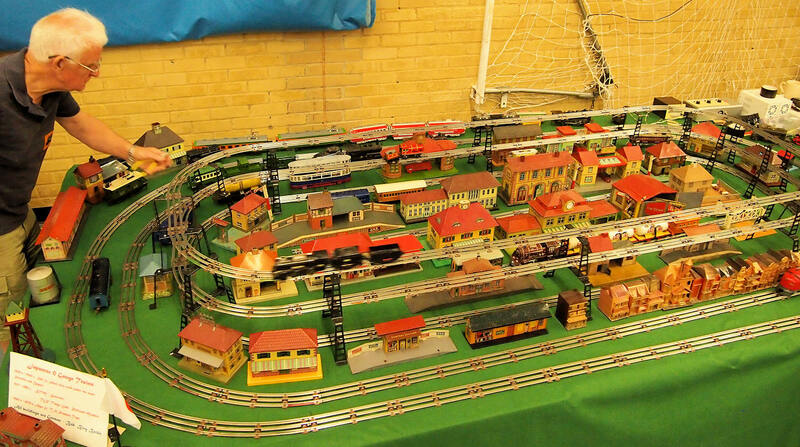 Andy also had an excellent display of sets. 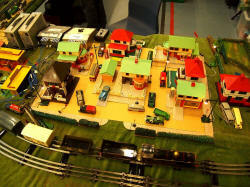 I was particularly taken with Lima SR green 4-wheel coaches which appear to be cut down Tri-ang stock! 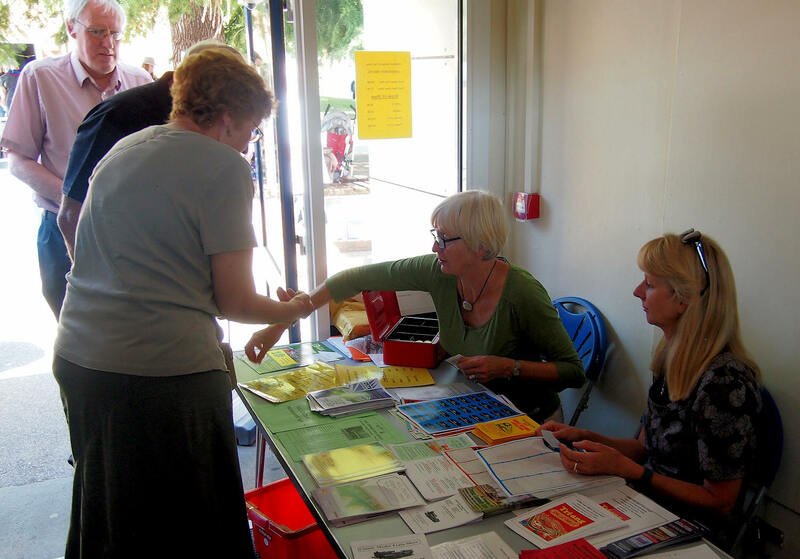 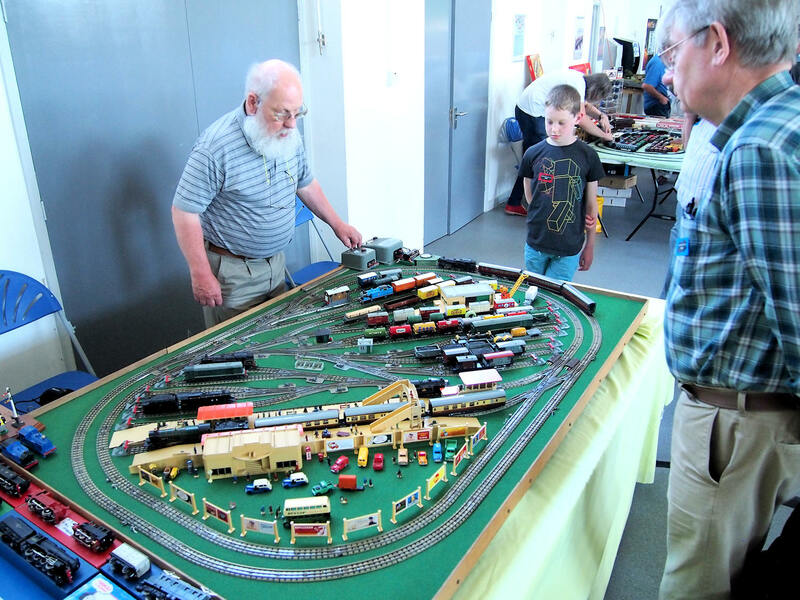 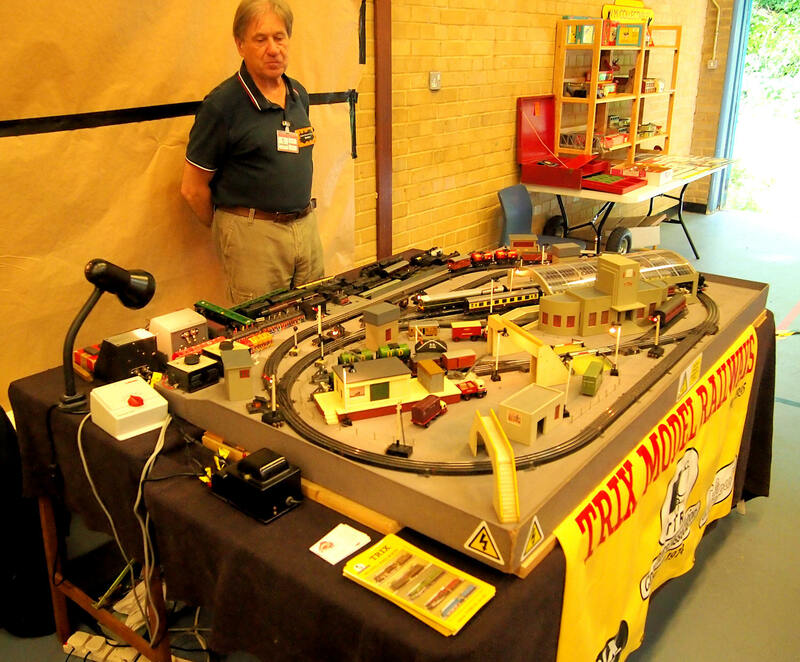 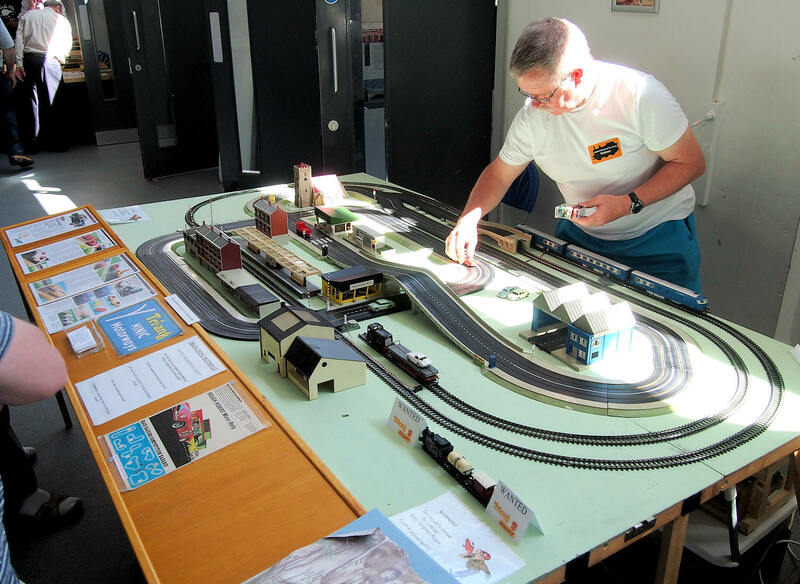 Alton Model Railway group were on the look out for new members and Steve Cook , Roger Joel and other members came along with a couple of their N Gauge layouts to try and woo some new members. 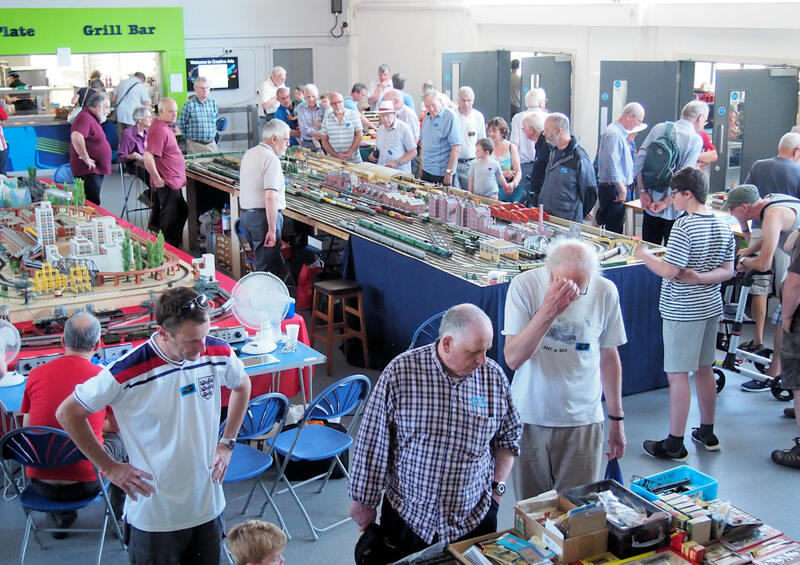 The centre of the hall was filled by two large layouts, Les Martin with help from Dave White, Neil Smith and Paul Rees has set up a mammoth 24’ Tri-ang Transcontinental Layout including Australian and New Zealand Models. 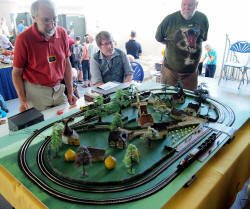 Les had prepared well and they had seven tracks running all day long. 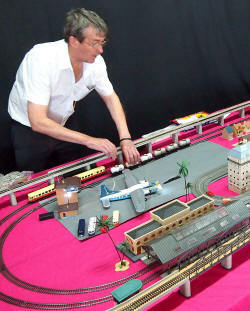 A high level area had also been created in the middle where the trains left the boards to go through the Rockies (Airfix Monte Carlo boards). 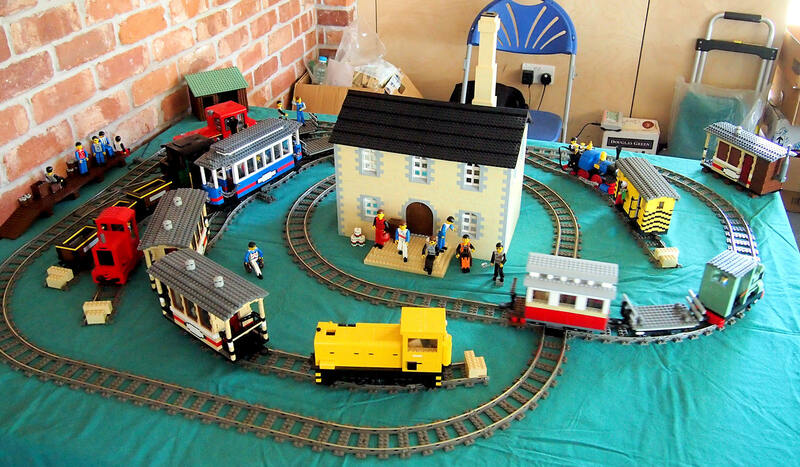 I even spotted a Tri-ang Cable Car set. 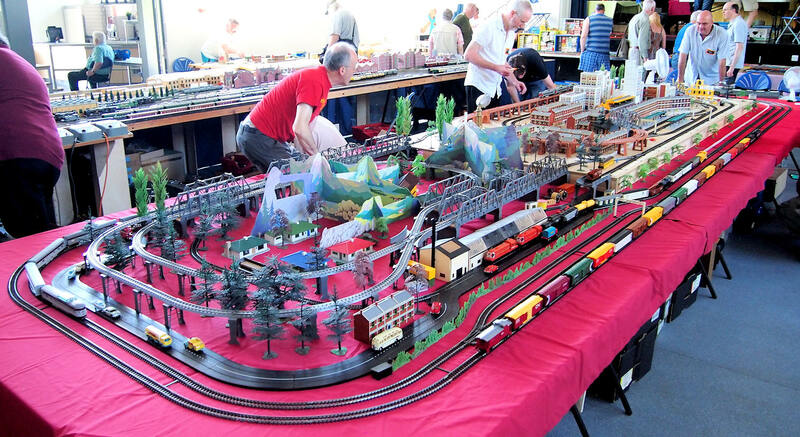 A much admired layout. 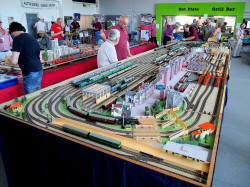 The Chiltern group had their large Hornby Dublo Wrenn 2-Rail layout and as usual were running full length Trains all day. To coincide with the Silver Jubilee a ‘Wrenn’ Quicksilver was on duty with a rake of Silver Jubilee Coaches. 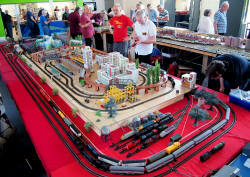 Again a popular layout with visitors who love seeing the long trains. 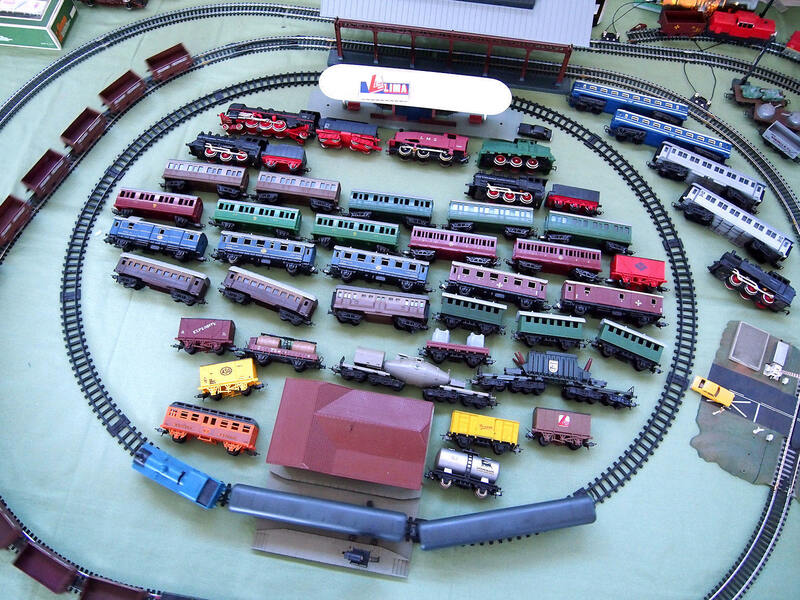 The stage was full. 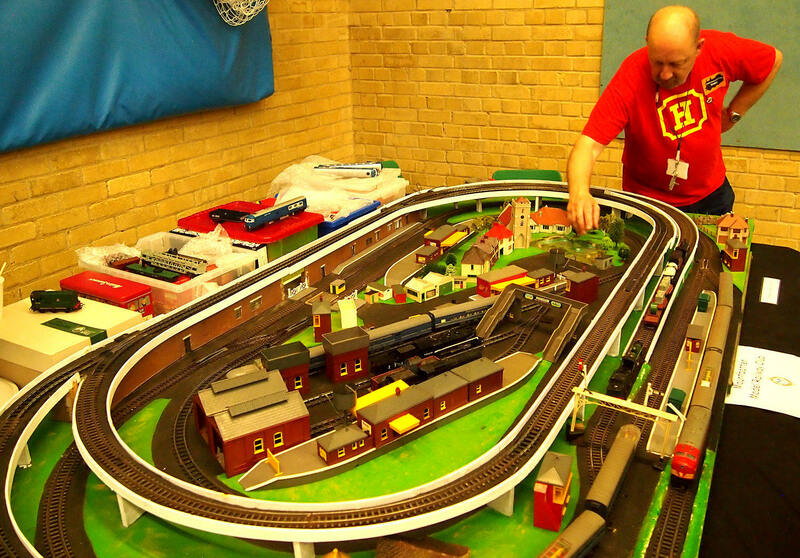 In the middle Neil Bowsher was running a Hornby Acho layout with a large high level circuit and two low levels with a full street of Jouef buildings. 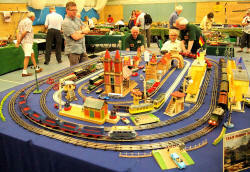 In the centre was Neil’s latest pride and joy. An Airfix Bristol Freighter in Sabena colours with a Kibri ‘ Airport Tower’ both with lights place by the small runway. 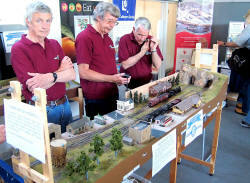 In front Nick Gillman and John Bruce were enjoying running Nick’s ‘Historic 00 Gauge ‘ layout. 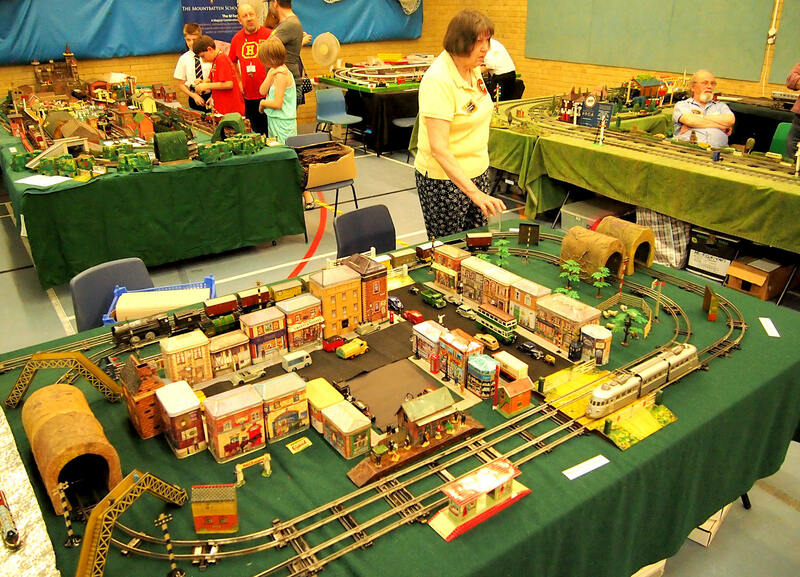 Including a Tri-ang Rocket and several kit built Locos and coaches with Tri-ang Countryside buildings this looked every part a mid 19th Century layout, such was it’s appeal; Nick was invited to attend three other shows! 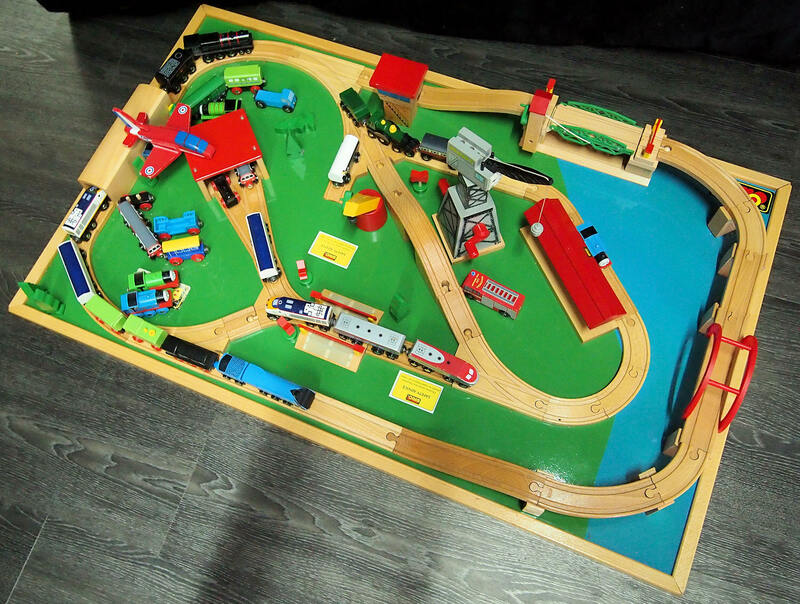 Four Marks Scouts were running their modern Hornby 00 Gauge layout and a Brio set was on the floor for the very young and a Table for Lone Star 000 was available for visitors to play with. 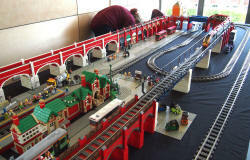 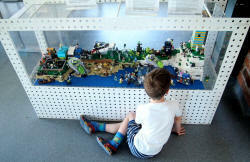 In the extension Peter Corish and Members of the Bricikish Association took one whole side of the building and several other tables with a large Lego railway, Lego displays and Duplo Trains, A large table full of bricks and a seek and find game as well as a separate Train layout with a special truck created by Peter to celebrate 25 years. Moving outside to the Sports Hall, we pass ABC Models and Richard Panes Trading outside, Graham Bilbe with help from Harriet Mustard were running 100 year old Gauge 1 Live Steam and Clockwork as well as LGB Trains with Trolley Buses and Trams making an appearance. 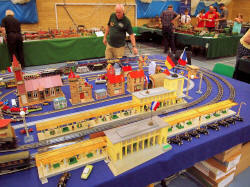 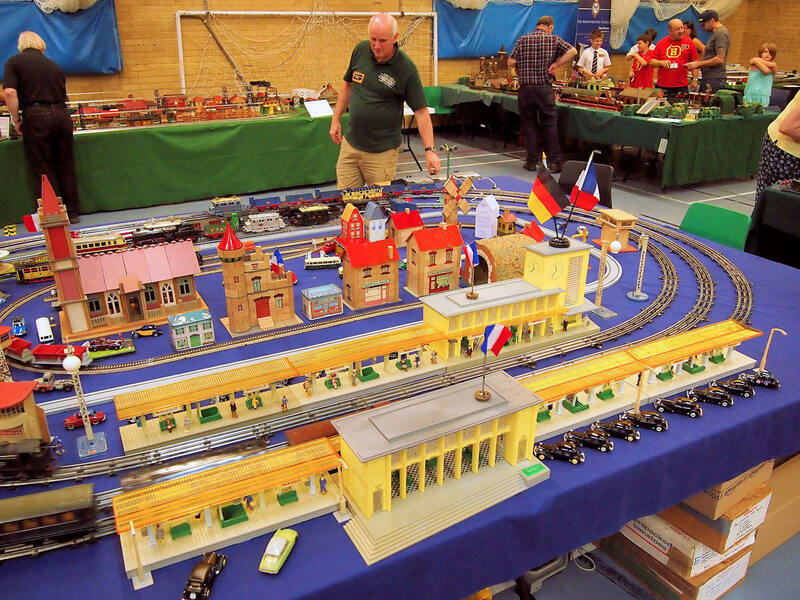 On the wall Bryan Pentland had set up a wonder triple level layout and was running Japanese Tinplate with a collection of German buildings. 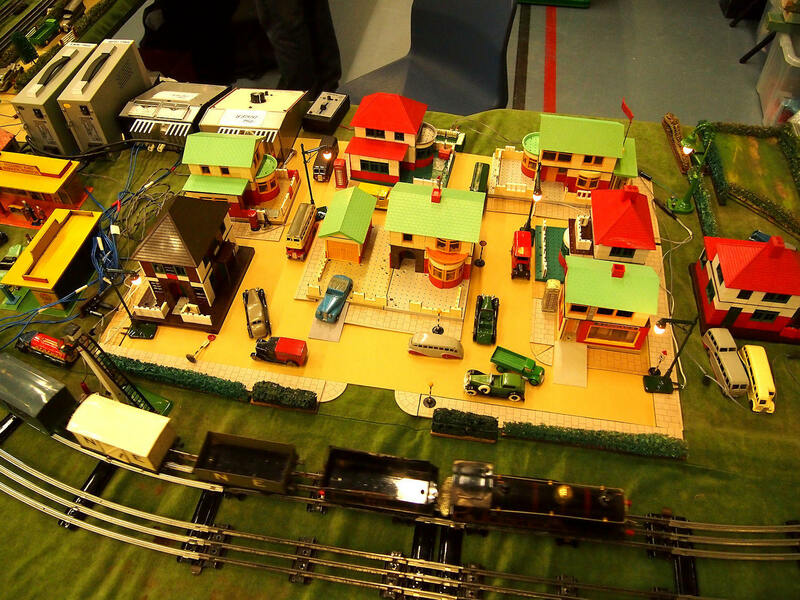 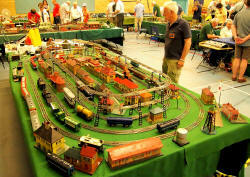 One of the most colourful layouts at the show which always had something running. In the corner Andrew Smart with the Mountbatten School Model Railway Club had two layouts. 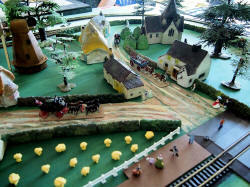 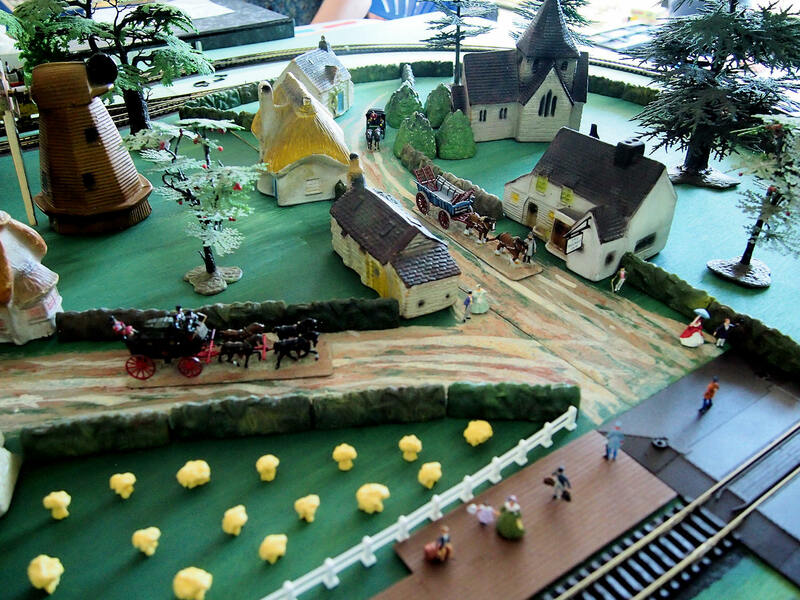 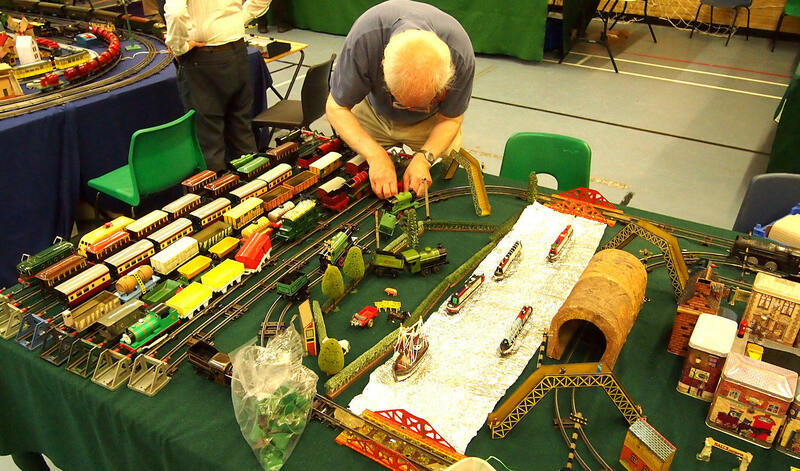 One was a clockwork O gauge layout with a host of interesting wooden buildings and homemade scenery together with several dioramas such as the village cricket team. Running was mainly Hornby post war stock. 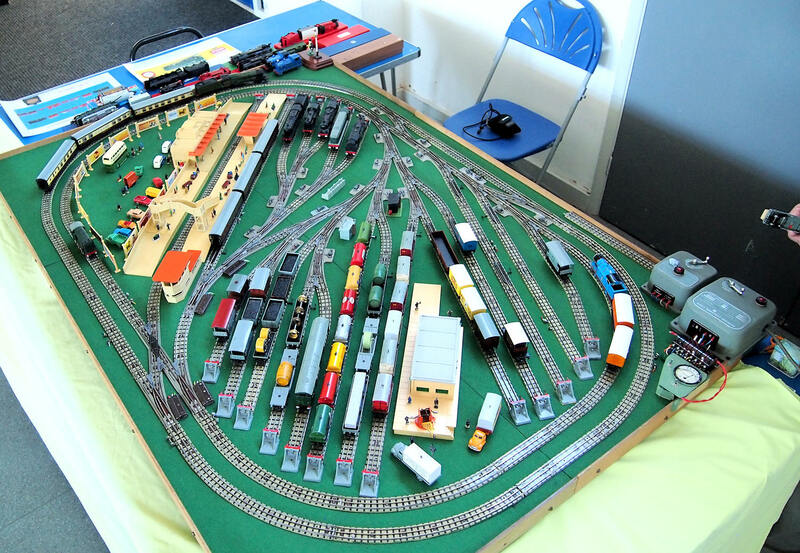 The other layout was a Tri-ang Standard Track/Series three track layout that the Club has been restoring over the last two years and featured Tri-ang stock from the late 1950’s. On the far wall the Mortimer HRCA Group led by Howard Star-Keddle were running pre-war Electric Hornby O Gauge and modern Ace and Darstead Locos. 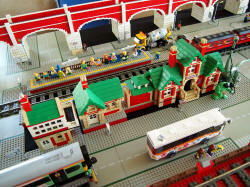 Joining in with the 25th Anniversary I spotted Silver Fox with a full rake of Jubilee Coaches, there was also a Bayko Village with early Dinky vehicles. 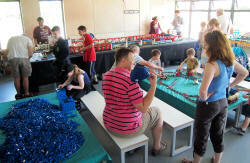 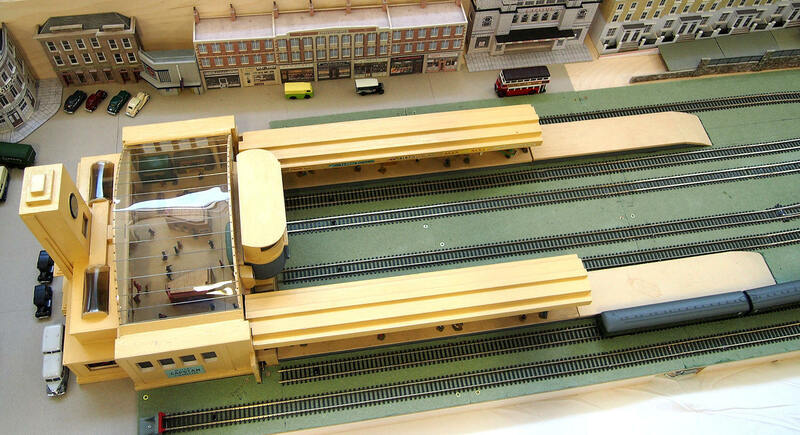 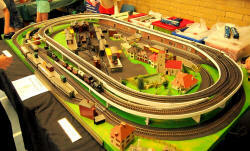 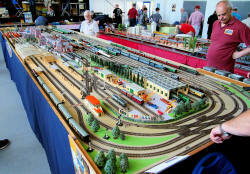 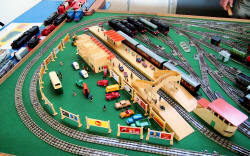 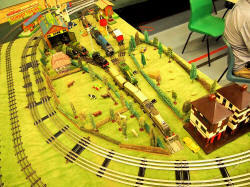 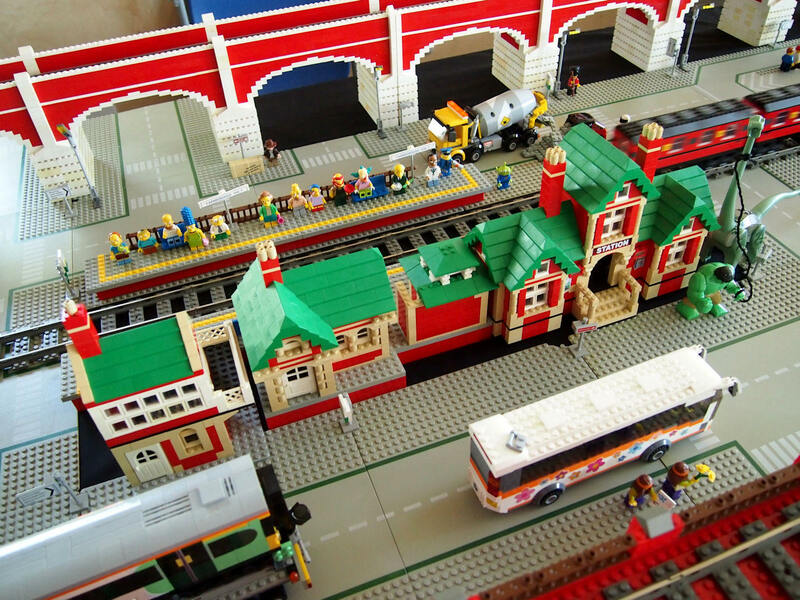 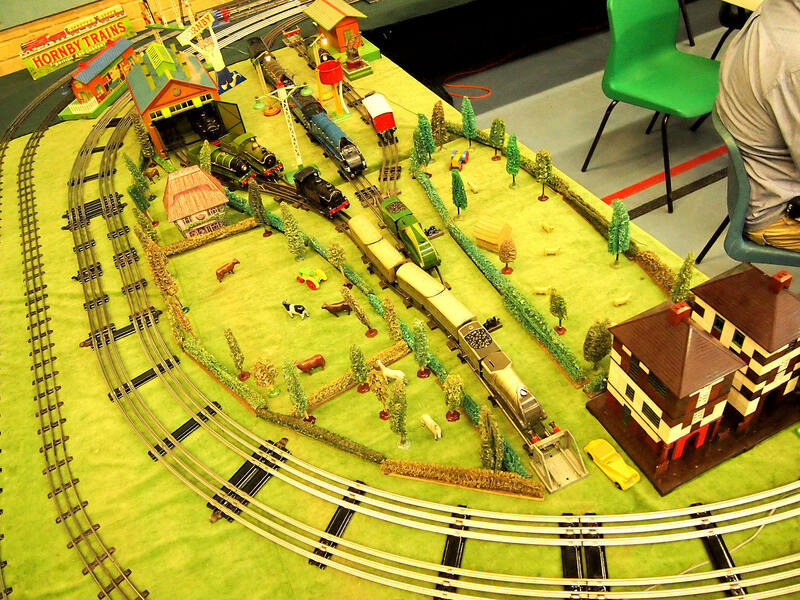 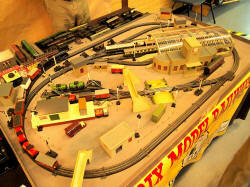 A very popular layout with three running tracks and plenty of scenery to admire . 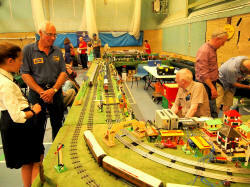 In the middle John and Briony Hollands were running Hornby clockwork MO Series Trains and had a lovely tinplate village and canal display. 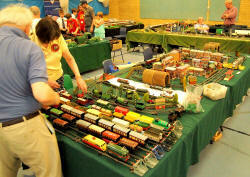 John and Briony kept running all day long with the occasional help from some battery operated locos. 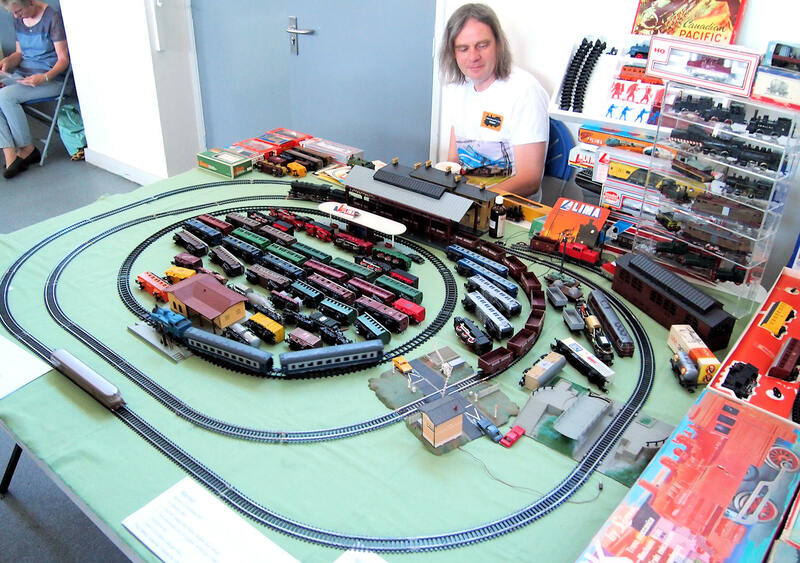 Adam Heely with help from Bob Boorman had a superb continental O gauge layout mainly running French and German trains with scenery by several manufacturers. 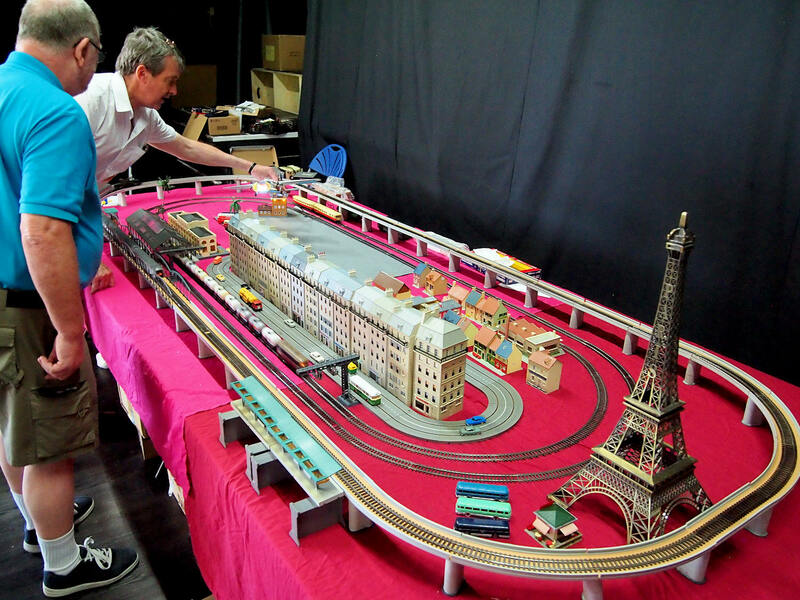 A very impressive French Hornby Marseille Station was centre piece. 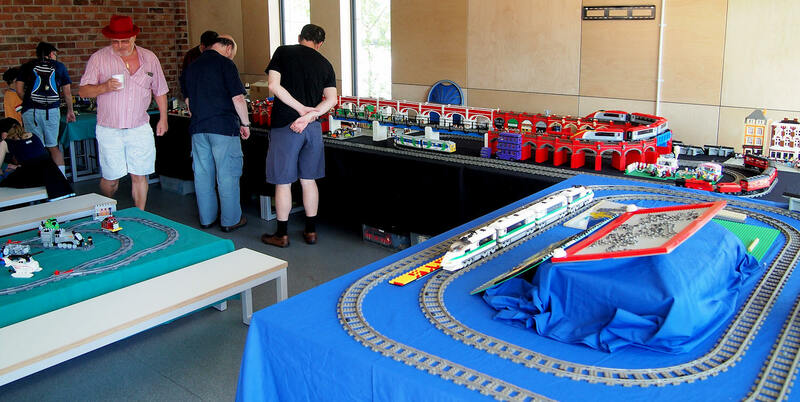 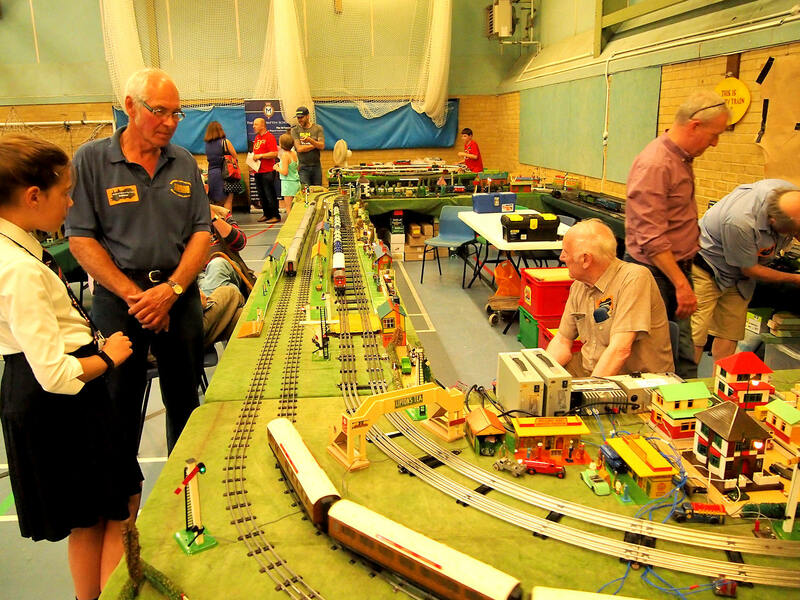 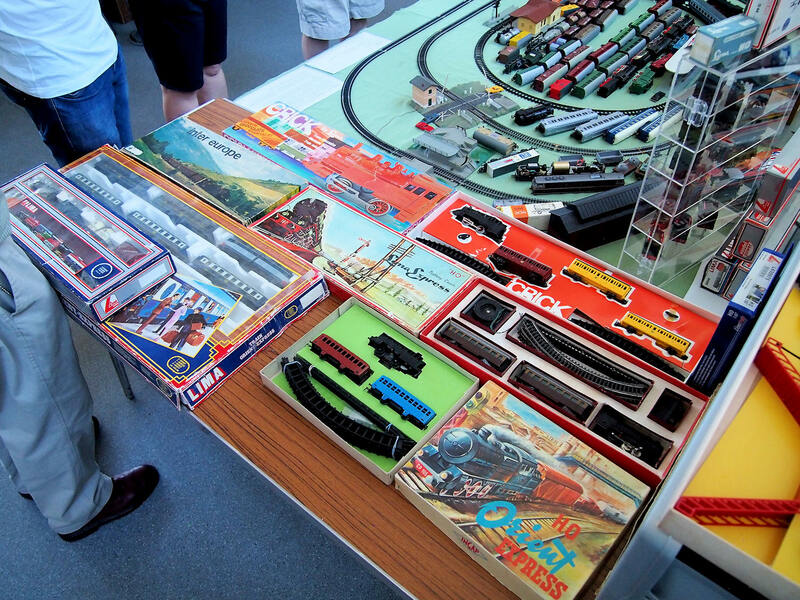 Trains by Jep, LR and Marklin kept visitors happy all day. 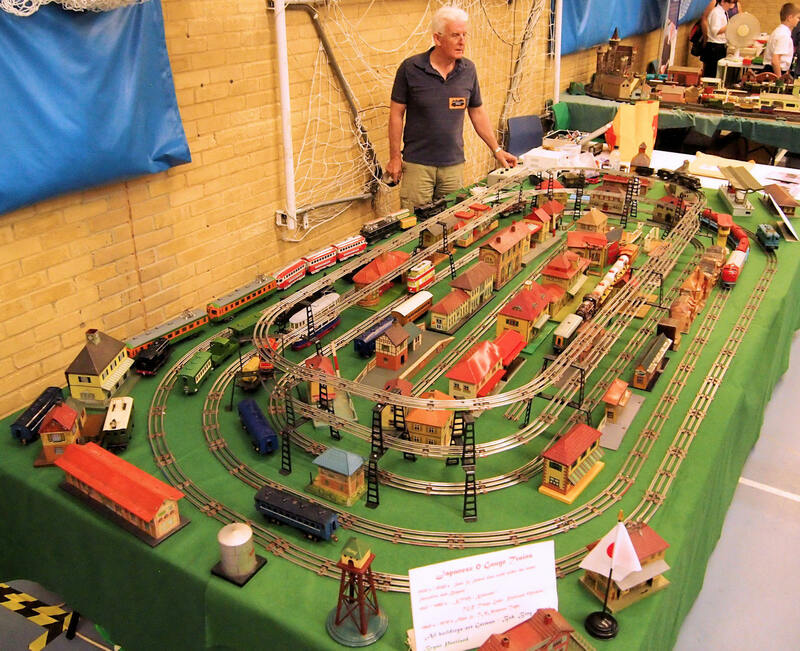 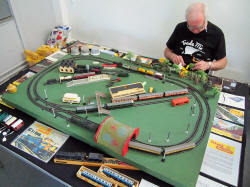 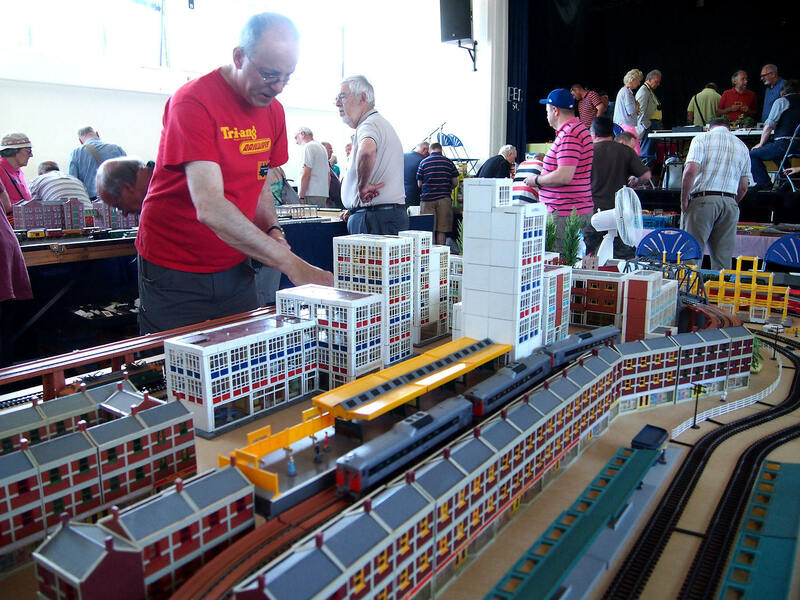 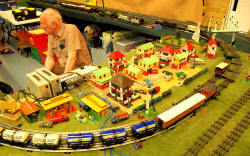 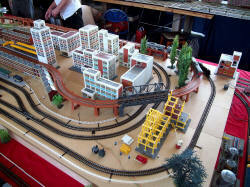 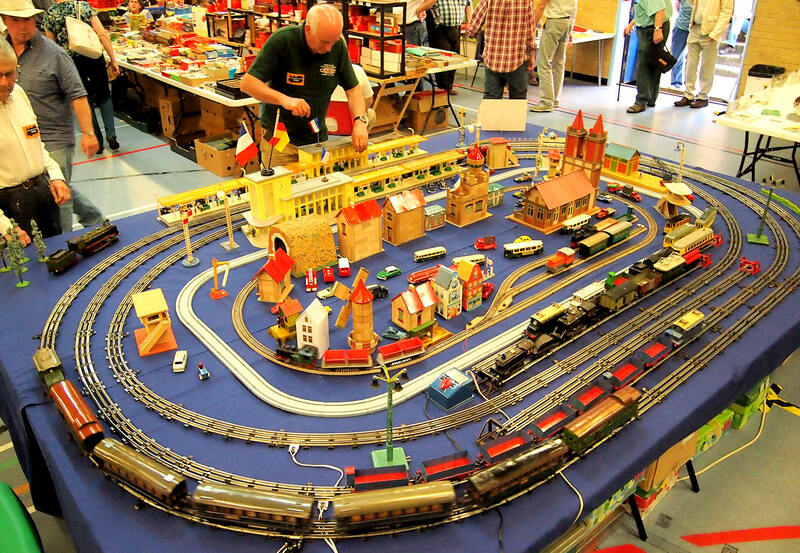 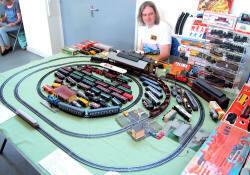 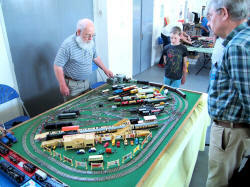 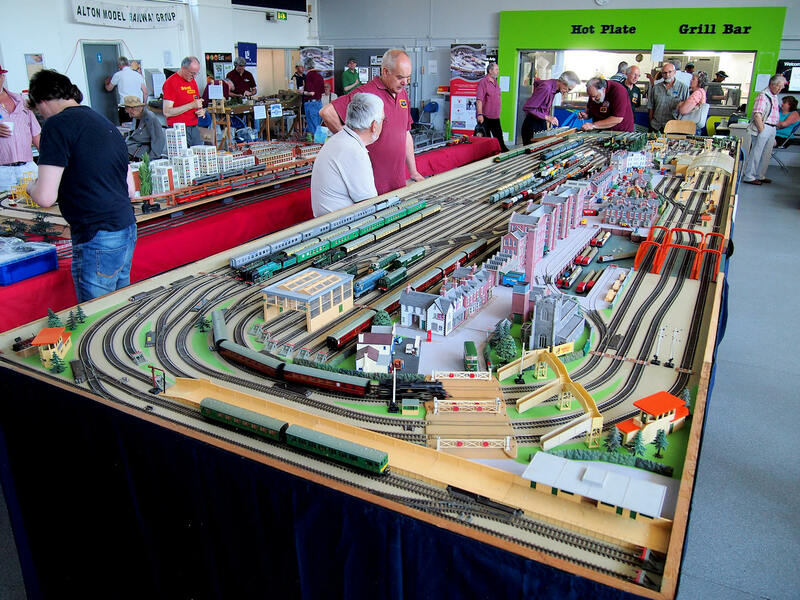 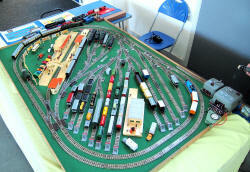 In amongst the traders Clive Parker was running Trix on his very compact layout. Fitting in as much as you possibly can this layout is always a delight to watch. 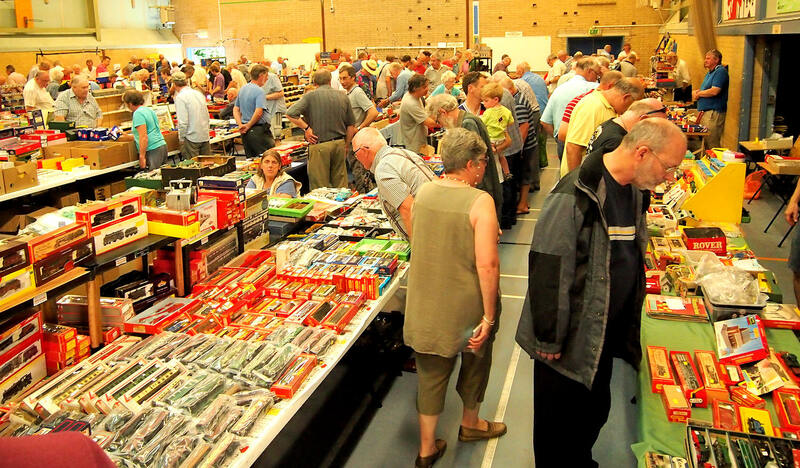 The rest of the hall was devoted to 80 sales tables. 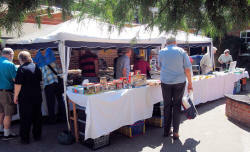 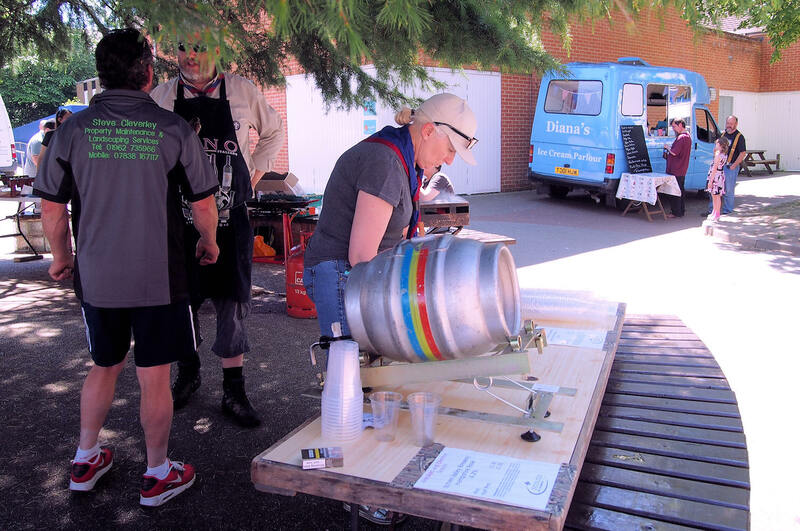 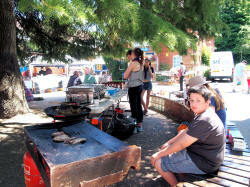 Most traders reported excellent sales, two regulars had their best ever Alresford. Thanks to Four Marks Scouts who organised the Car Parking and refreshments including Bacon Butties in the morning and tea all day long, Cheriton and Alresford Scouts who ran the BBQ and sold Real Ale and a big thank you again to the Alresford branch of Save the Children who manned both entrances. Over £2000 was raised for and by the Scouts and Save the Children.